I got back from the Madison Print and Resist Festival last weekend, so that means only one more show of the year -- MKE Zine Fest Nov. 9. John P. loves tabling, but he's getting old and tired, and he's chomping at the bit to find out whether he still knows how to make comics, so he's looking forward to a nice, long winter of STAYING PUT AND DRAWING. Print and Resist was so good that afterwards I had that kind of shaky, is this real? kind of pure joy that makes me feel inevitably like when's it all going to come crashing down-- but I'll take what I can get. 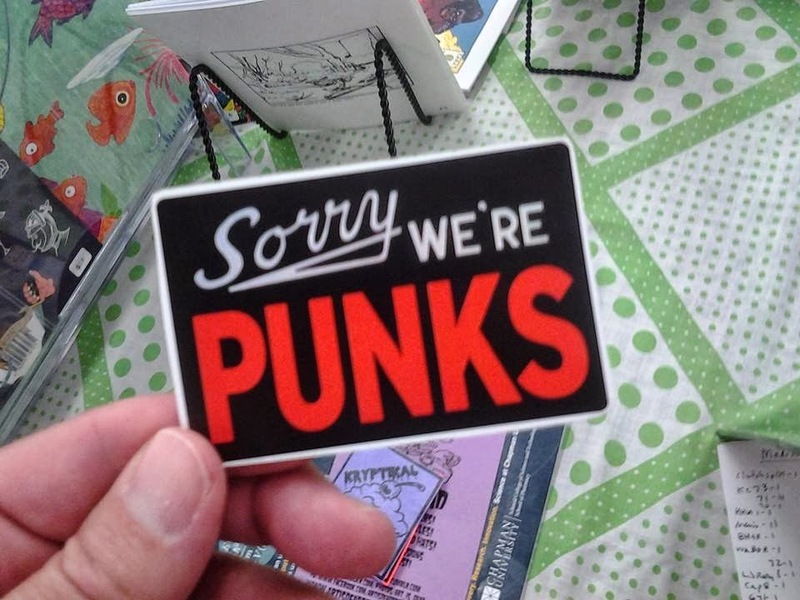 I love the Midwest, I love zines, I love weirdos, so I loved Print and Resist. It was held in the Helen C. White Library at UW-- I mean literally in the library -- my table faced the New Magazine Releases ( I read a great Discover article about OCD during down times). 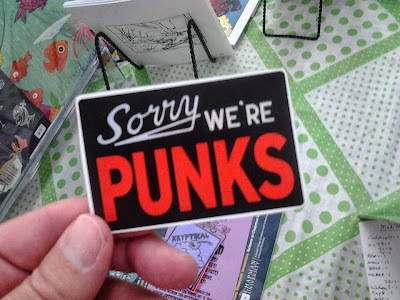 Picked up some nice books and zines, a cool anti-Walker poster, talked to a lot of swell people and got a workout dragging my 100+ pounds of books eight blocks from the closest parking I could find (apparently, overnight, the library had become besieged by construction). My arms and shoulders still hurt! And I can feel muscles in my thighs I didn't know I had! But I sold lots of Kool Komix to awesome people, so that's why I was born. Well, my fabulous readers, John P. is going to drive to Minneapolis again this weekend, for the Rain Taxi Book Festival. If you're in the Twin Cities, do us both a favor: come on down and buy a book or two off your humble Used-Paper Salesman. 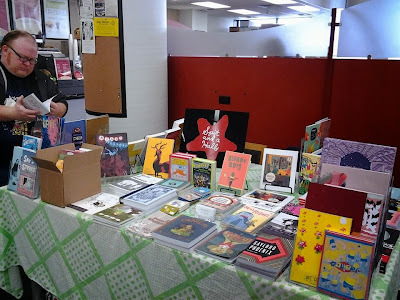 Then the next weekend I'll be at the Madison Print and Resist Festival -- but please don't resist your urge to drop by and check out all the cool zines and comix I'll have on hand there! My last show of 2013 is the Milwaukee Zine Fest, held Nov. 9. This is one of my favorite shows of the year, and I'm looking forward to going out on a high note. So all you zine-hungry Milwaukeeans, don't let me down, OK? Other that that I'm going CRAZY because I never seem to have time to draw anymore. Right before leaving for PFC/Autoptic in August I had the whole issue of King-Cat #74 drawn, save the cover. Guess, what? It's two months later and I'm in the exact same spot. After all the inspiration I got working with the world's greatest cartoonists at PFC, I have managed to draw exactly nothing. But this shall change. Look for #74 to be out maybe late October, with a special Halloweeny cover. Then I'm going to stay at home all Winter and just draw. You can't stop me!